On April 2, when Vietnam and Desert Storm veteran Rick Fall went to his favorite restaurant to enjoy his 20th wedding anniversary, he was surprised when he was turned away. He’d brought Ben, his service dog, to Riverwalk Grill on at least six occasions before with no incident. That night, however, a (presumably inexperienced) server told him to leave the restaurant despite being told “‘at least six times” that Ben was a service dog. To be proactive in ensuring the incident is not repeated in his restaurant, Mr. Dennings is working on establishing that employees are educated on dealing with service dogs, to include having them sign a statement that they understand. He is also hosting a service dog workshop that will cover understanding service dogs in the community and what to do if you suspect a fake service dog. This incident underscores the difficulty in preventing incidents with, and embarrassment to, veterans with service dogs. In this instance, it is likely the restaurant staff on duty that night did not know how to address the issue of a patron with a service dog. It’s hard to educate staff on such matters, especially given the turnover of restaurant staff and the relative rarity of such an incident. As a result of this difficulty, poor Mr. Fall didn’t get his anniversary meal, and the restaurant received negative attention. The lesson here is for small business owners who cater to the public. Under the Americans with Disabilities Act (“ADA”), you must accommodate individuals with service dogs. If it is not obvious that a dog is a service animal, a public entity or a private business may ask only two questions: 1) Is the animal required because of a disability? and 2) What work or task has the animal been trained to perform? Here, the wait staff should have asked Mr. Fall these questions, and, when reasonably satisfied, brought Ben a bowl of water. He’s a customer, too! For more information on service dog requirements under the ADA, click here. Also, if you’re interested in receiving updates relating to veteran and small business issues, subscribe at http://www.legalmeetspractical.com. Remember to click the link to activate your subscription! 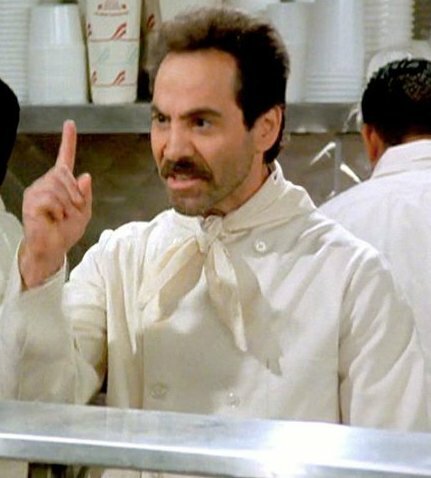 “No soup for you?” Think before you enforce that rule.